In a large skillet with a tight-fitting lid, pour 1/2 inch water; bring to a boil, and season generously with salt. Add green beans and carrots. Return water to a simmer, cover skillet, and steam until vegetables are crisp-tender, 4 to 6 minutes. Transfer to a colander; rinse with cold water to stop the cooking process. Rinse skillet with cold water to cool it down. Place salmon in skillet, and add cold water to cover; season with salt. Bring water to a boil over high heat; cover skillet, and remove from heat. Set aside until salmon is opaque throughout, about 20 minutes. Remove from skillet, and let cool. In a small bowl, stir together yogurt, curry powder, and cilantro; season with salt and pepper. 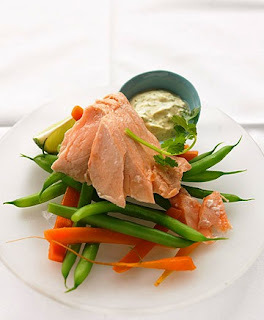 Break salmon into large pieces; serve with vegetables and yogurt sauce. Garnish with cilantro, if desired.